Dorm: Dormitary beds in 8 bed dormitary @ R160 per bed per night. 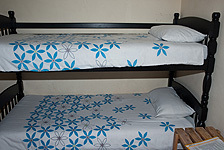 Bunk Room: Small room with bunk bed and own hand basin, shared toilet and shower @ R350 per night for 2 people. Green Door: Room with double and single bed. Own shower, hand basin and toilet @ R500-00 per night for 2 people plus R160-00 per night for extra person. Allan Room: Room with double bed and double bunk bed with own shower, basin and toilet. Coffee tray and bar fridge in room. R550-00 per night for 2 people plus R160-00 each per night for 3rd and 4th person. Family Room: Family room with 2 double beds and 3 single beds, shared facilities @ R400 per night for 2 people plus R160 each per person per night for 3rd, 4th, 5th, 6th and 7th person. eg. for 5 people = R400-00 + (3 * R160-00) = R880-00. Room 6: Room with double bed and single bed@ R400-00 per night for 2 people plus R160-00 per night for 3rd person. Camping in the garden with use of all hostel facilities @ R70 per person per night. Room 1: Room with double bed and 3 single beds and shared facilities @ R400 per night for 2 people plus R160 each per night for the 3rd, 4th, 5th, 6th & 7th persons. 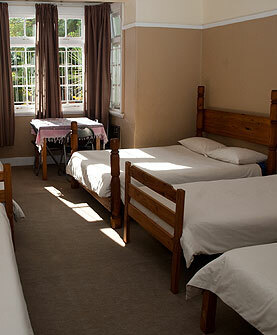 Room 2: 4 bed dorm with shared facilities @ R160 per person per night. Room 3: Room with bunk bed (bottom double bed, top single bed) and shared facilities @ R400 per night for 2 people plus R160 per night for extra person. Room 4: Room with bunk bed (bottom double bed, top single bed) and shared facilities @ R400 per night for 2 people plus R160 per night for extra person. All double rooms available as single @ double rate minus R160. Our rates are subject to change without notice. We will confirm current rates on enquiry.